Is this Christmas going to be a first of something for you or someone you know? Consider sending someone personalized Christmas tree ornaments! 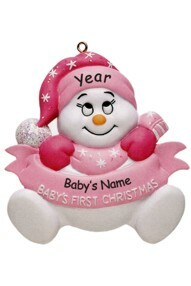 We have the perfect personalized Christmas ornament for the most important firsts! Our engraved Christmas ornaments selection includes baby's first Christmas, a couple's first Christmas, a wedding celebration remembrance, a new home, or a pregnancy. Pick the personalized Christmas ornament that best represents what you are celebrating. 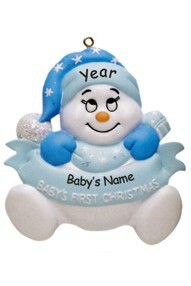 You can include on our engraved Christmas ornaments names or years. There are many Christmas tree ornaments to choose from! Celebrate all life's moments and remember them year after year when you decorate your Christmas tree with our personalized Christmas ornaments. 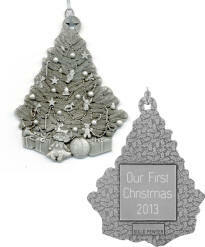 A wonderful quality solid pewter ornament, made in USA. Tree has crystal accents and an engraving plate on the back. Solid pewter ornament, made in USA. A quality that is very hard to find! 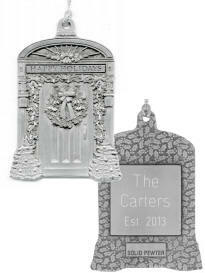 Beautiful new home ornament can be engraved on the back plate to create the perfect memory of your new home. 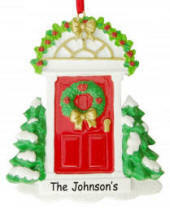 This red door Christmas ornament can be personalized with up to two lines of text. Personalize with the family name, and the street address, or the date. This ornament is personalized by hand. A special way to celebrate with the parents-to-be this Christmas season. Such a cute baby shower gift for the mom awaiting the miracle of birth. Each ornament is hand painted and carefully personalized. Gift bagged. 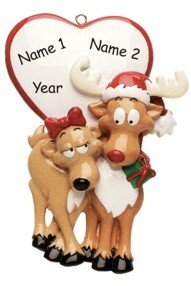 Celebrate an engagement, a new relationship, or a wedding with this very cute "be my dear" ornament. Personalized with names and a date.